It’s the Evil Midnight Bomber What Bombs at Midnight! Sure, Amazon’s new Tick show is great and all, but will we ever get to see old friends like Chairface Chippendale, the Breadmaster or—please, please—the Evil Bomber What Bombs at Midnight? We went straight to The Tick creator Ben Edlund and demanded to know, and his firm, emphatic answer was... maybe. The entire first season of The Tick is available to stream now on Amazon Prime, letting viewers roll around in the fluffy super-love flowing between the title character and Arthur. Since fans love the original animated series and its previous live-action incarnation, they’ve been vocally wondering if any of those characters might get a chance to live again on the new series (especially since season two is on its way). I’d assumed the answer would be no, but decided to ask Edlund anyway when I interviewed him and executive producer Barry Josephson last week—but I didn’t get the answer I expected. io9: I’ve been consistently getting one question from people who are watching: They want to know if you’ll be revisiting previous iterations of characters from The Tick. The Evil Midnight Bomber What Bombs at Midnight, Chairface Chippendale. Is it important to you to not revisit these characters? Ben Edlund: It’s not important not to revisit those characters—those things are potentially open. Some of them, unfortunately, like the Bomber, are just a cartoon rights thing. Chairface... certain things can live. I want to see them alive in this universe. I feel like... they are naturally laden with other things. The Terror can live in all these universes, because he’s kind of graduated to this iconic, seminal figure of bad. These other things are, I think, stuff I want to play with. Barry Josephson: Ben is living this really good life of inventing and having reverence for [things] the audience likes. You know, when you look at this season, the Terror was something people liked, and he likes, and he wanted to write that. And you look at Overkill’s character, Miss Lint’s character, the Bomber’s character, the story [is something] that Ben has dreamed up and [has been] wanting to tell. I think the most important thing is he’s inventing something new for the show. But we both really feel strongly that we want to hear what people loved, and would love to see, because that’s always a good thing to do. And I think the Marvel Universe does that really well, too. They lean in and listen to that. They understand the audience. Edlund: And when they bring characters up from the storied past of Marvel, there’s always a wonderful charge in that, so that’s something we want to take advantage of. But there’s a certain first, reflexive muscle [twitch] that is about saying, “We’re not dependent on what came before us.” Then, we get less defensive. The pair’s comments make it sound like—now that they’ve established this mutation of the Wild Blue Yonder—they’re open to figuring out how they can reinvent previously seen characters. The little smidge of proffered hope is tantalizing because, if nothing else, the new Tick has done a great job of reimagining and deepening something that fans already loved. Spotify has finally filed to go public, and in doing so the Swedish company has shed light on another huge music company that has been tipped for IPO — Tencent Music — which is now valued at over $12 billion. Tencent and Spotify announced a share swap in December that saw each side take an undisclosed slice of the other for strategic purposes going forward. According to Spotify’s filing, it took nine percent of Tencent Music Entertainment (TME) which it valued at €910 million at the time. That translates to a total valuation of €10.11 billion, or $12.3 billion, although Spotify includes 10 percent leeway above and below that figure. In exchange, Tencent — which became Asia’s first $500 billion business last year — got 7.5 percent of Spotify to become one of its largest shareholders. It bought its stake using a mix of newly issued shares and secondary, but the value of that holding is around $1.5 billion based on a rough $20 billion valuation for Spotify. TME was reportedly raising money at a valuation of around $10 billion in October, according to a Bloomberg report, and it has been tipped to raise as much as $1 billion in a listing that could happen this year. More color on this Spotify — both in terms of TME’s valuation and Tencent’s position as a major Spotify investor — give a little more insight into how the two companies might work together. “Spotify believes the Tencent Transactions allow Spotify to invest in the long term potential of the music market in China and, in turn, TME to invest in the long term potential of the music market outside of China,” Spotify wrote in its filing. Spotify also disclosed that it holds a registered trademark on its name in China. One source close to the company who spoke to TechCrunch in recent weeks said that Spotify had actively looked into the potential of the Chinese market a number of years, going as far as sending engineers and business development staff to meet with prospective partners. In Tencent, it has found perhaps the most ideal partner should Spotify decide to pursue opportunities in China. And there are plenty of opportunities. TME is the leading player in a market where there are over 20 million paying streaming customers with more growth to come. China’s music industry itself grossed 320.5 billion yuan ($48.33 billion) in 2016 with eight percent annual growth, according to a report. Licensed streaming revenue grew by one-third to push revenue from music and video copyright to 183 million yuan. Best known for its WeChat messaging app, which is China’s go-to chat service, Tencent offers three services — ‘QQ Music’, ‘Kugou’ and ‘Kuwo’ — while it also operates Joox in Southeast Asia and has invested in U.S. karaoke app Smule. Earlier this week, Tencent also brokered another music alliance after it led a $115 million investment in India-based music streaming service Gaana. Outside of music, Tencent has invested widely in overseas technology companies. Its investments have included Tesla, Snap, HERE, Amazon rival Flipkart, Uber competitor Ola, and more. Stockholm-based streaming giant Spotify finally made it official and filed documents for its much-rumored plans to go public on the New York Stock Exchange on Wednesday, pursuing the unusual option of a direct listing instead of a traditional IPO. Per the New York Times, that process is one “in which no new stock is issued—and therefore no money is raised,” and that will allow investors and insiders to freely trade shares on the market. In other words, it bypasses the traditional method by which Wall Street financial institutions would stage-manage the entire IPO process, which means Spotify shares could immediately experience volatility as the company sprints out the door. In his 1,259-word founder’s letter, Spotify CEO Daniel Ek was significantly more orthodox, in the sense that like every tech CEO, he is now touting a vision of their company becoming the cultural platform of the future or something. We envision a cultural platform where professional creators can break free of their medium’s constraints and where everyone can enjoy an immersive artistic experience that enables us to empathize with each other and to feel part of a greater whole. But to realize this vision, professional creators must be able to earn a fair living doing what they love, where monetization is at the core of a creative proposition and not an afterthought. We care deeply about our creators and our users and we believe Spotify is a win-win for both. That’s our mission—to unlock the potential of human creativity—by giving a million creative artists the opportunity to live their art and billions of fans the opportunity to enjoy and be inspired by it. This is the future we envision; where artists cross genres and cultural boundaries, creating ideas that propel society forward; where fans can discover something they never would have otherwise; where we’re all part of a global network, building new connections, sharing new ideas, across cultures. It goes on and on like this, though as Business Insider noted, it’s at least “respectfully shy” of Facebook CEO Mark Zuckerberg’s 2,189-word 2012 manifesto. The filing showed that the company’s revenue is growing sharply but its losses are ballooning. It posted €4.1 billion ($5.02 billion) of revenue in 2017, up nearly 39% from the prior year. The company, which has yet to turn a profit, posted a loss of €1.24 billion in 2017, wider than losses of €539 million in the prior year and €230 million in 2015. Spotify now claims to have 159 million monthly active users with 71 million paid subscribers, which is impressive growth. But Bloomberg recently noted that rivals with very deep pockets like YouTube, Apple, and Amazon are all trying to scale up their operations and have shown a willingness to play dirty when it comes to competitors’ access to their hardware products. They’re willing to burn cash on music just to create synergy with that hardware, whereas Spotify doesn’t have the luxury of being funded by a larger product line. Apple Music in particular is preloaded on Apple devices and has grown immensely as of late in the US, regularly pulling out its huge wallet to pay for exclusive music deals. 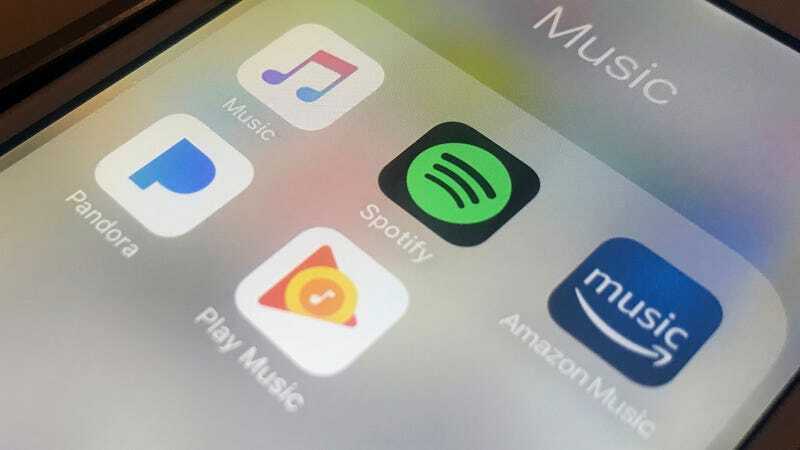 It may yet turn out that piles of cash and multi-platform market dominance will end up determining the future of the streaming market, not soaring utopian ambitions. One of the world’s most popular soccer clubs has finally launched its own YouTube channel. Manchester United’s official YouTube presence has been a long time coming, with the club becoming the last in England’s top-flight Premier League to get one sorted. Subscribers are promised plenty of original content, including “unique behind-the-scenes access” to its famous Old Trafford ground, as well as exclusive player features, and all the latest goals and match action. The intro video (above) features some of the team’s top players, with coach José Mourinho even finding time to make a brief appearance. The channel will also take fans inside the club’s world-renowned Academy, and post videos highlighting some of the team’s legendary players and classic matches from its long and ilustrious history. According to YouTube, United has for a long time been the most-watched sports club on the streaming site, even without an official channel. Just a few days after launch, the club’s new YouTube channel has already picked up 360,000 subscribers and its 100 videos have so far been viewed 4.5 million times. While results on the pitch are of course the priority, you can bet that United will still be keen to score more subscribers than the current top-performing soccer club on YouTube, Barcelona, which has gathered 3.8 million followers over the last 12 years. Manchester United currently has 71 million Facebook followers, so there’s plenty of expectation with its new, official YouTube effort. Up to now, United supporters have been able to get their off-the-field fix via the club’s MUTV pay-TV channel, but the YouTube presence is seen as a way to grow the club’s brand and reach more of the youth market around the world. MediaTek wants to make midrange phones a little more powerful. The company announced at MWC 2018 the new MediaTek Helio P60 chipset, which is aimed at offering many of the specs that you would expect in a flagship chip, but in a more affordable chipset aimed specifically at midrange devices. Perhaps most interesting is the fact that the chip is among the first midrange chips to feature a so-called “big.LITTLE” architecture. In other words, it features eight cores — four more powerful ARM A73 cores, and four ARM A53 cores. What that means is that the more powerful cores can handle more intensive tasks, leaving things like background tasks to the less powerful cores. That ultimately will result in a much more efficient chipset. How much more efficient? Well, MediaTek claims the Helio P60 offers a 70 percent CPU and GPU performance boost over its predecessors, the Helio P23 and Helio P30. The chipset is also more power efficient — and MediaTek claims it will deliver up to 25 percent power savings for some power-intensive applications, and a 12 percent power saving overall. The chipset also boasts other high-end features, like MediaTek’s NeuroPilot and CorePilot 4.0 technology. NeuroPilot is basically aimed to enable artificial intelligence features like facial recognition, object recognition, and so on. It’s also compatible with Google’s Android Neural Network, supports TensorFlow, and so on — meaning developers can make use of NeuroPilot to create A.I. systems. The new chipset also places a pretty heavy emphasis on photography. The Helio P60 supports dual rear-facing cameras of up to 20 megapixels plus 16 megapixels — or a single lens of up to a hefty 32 megapixels. When it comes to communications, the Helio P60 offers 802.11ac Wi-Fi, an FM radio, and Bluetooth 4.2. It’s a little strange that the chipset doesn’t offer Bluetooth 5.0, though according to MediaTek the reason is that the release schedule of Bluetooth 5.0 and the development schedule of the Helio P60 just didn’t line up. 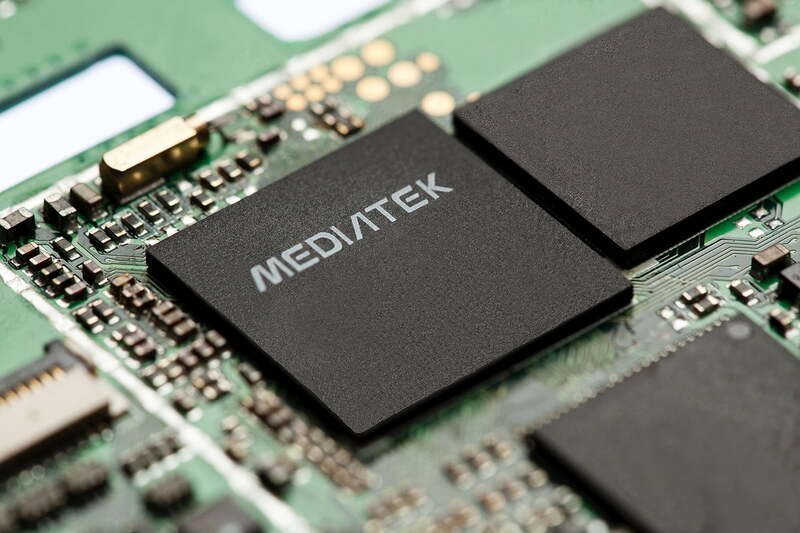 Of course, the MediaTek Helio P60 isn’t MediaTek’s flagship chipset — that title falls to the MediaTek Helio X30. So what’s the difference between the two? Well, while the Helio X30 has the same eight cores as the P60, but it has a higher clock speed, and as such it will be able to process a little quicker. The Helio P60 also may not offer the wide array of communications technology on offer from the Helio X30. Still, the fact remains that the Helio P60 looks to be a pretty excellent midrange offering and should help give midrange phones some more premium-tier features, especially when it comes to artificial intelligence. Sony Xperia XA2 vs. HTC U11 Life: Can Sony rule the midrange market? Honor View 10 vs. OnePlus 5T: Which midranger reigns supreme? Fintech startup Revolut can’t stop and won’t stop growing. The company has had an amazing month of December with a huge increase in the total volume of transactions and signups. Because of that, Revolut broke even in December for the first time ever. The company told me that it wasn’t just a lucky month and January is looking good as well. Revolut announced that it had reached a million registered users back in November. Three months later, Revolut now has 1.5 million customers. On average, Revolut now manages to attract between 6,000 and 8,000 new users per day. While social networks or messaging apps would be reasonably happy with those numbers, it’s ridiculously high when you compare this growth rate with good old banks. But the company is aware that it started off as a foreign exchange service. After signing up, you can top up your account using a debit card or a wire transfer. You can then exchange money into another currency and send it to a bank account. Revolut also sends you a debit card so that you can pay anywhere in the world with little exchange fees. Revolut now wants to convert those happy travelers into daily activer users. The app provides a better experience than most banking apps, and you can enable and disable debit card features in just a few seconds. And of course, the company has been adding new features to handle nearly everything you need to replace your bank account. You can now buy travel insurance, trade bitcoins, get a personal IBAN and open a credit line with your Revolut account. 350,000 users open Revolut every day. And the company has 800,000 monthly active users. Revolut now manages around $1.5 billion in transaction every month — this number is up 700 percent year over year. And this number should increase as well as Revolut plans to launch in the U.S., Singapore and Australia later this year. India, Brazil, South Africa and the UAE should come later. More importantly, margins are pretty thin for fintech startups. For instance, it took TransferWise six years to reach profitability (TransferWise reports a monthly volume of $2.1 billion/£1.5 billion). Many people believed startups that are competing with retail banks would have a hard time making money — the big banks in London make money on trading and credit after all. So today’s news is an encouraging sign for the space. Exploding batteries are back in the news after one of the devices went up in flames on a passenger plane in China on Sunday. While extremely alarming for those on board the China Southern Airlines aircraft, the jet was fortunately still on the ground when the incident took place, with passengers taking their seats prior to the plane’s departure. A video (below) of the incident shows an object burning in an overhead bin. A flight attendant can be seen squirting water at the flames before throwing the entire bottle at the fire, apparently extinguishing it in the process. But with smoke continuing to billow from the bin, a passenger then grabs another bottle of liquid to pour onto the ruined power bank. 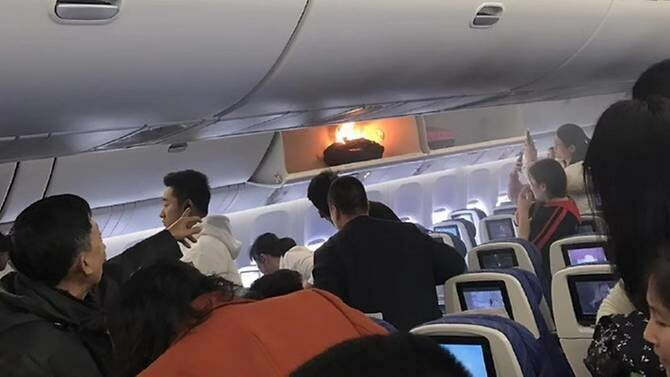 The airline said in a statement picked up by Channel News Asia that passengers were boarding flight CZ3539 when they spotted the flames coming from the portable charger. The make of the device hasn’t yet been revealed. The fire was fully extinguished and no one suffered any serious injuries, the airline confirmed. Passengers were quickly evacuated and flew later on Sunday on a replacement aircraft. Police questioned the owner of the power bank and learned that the device had not been in use when it started burning. Lithium-ion batteries, whether built into devices like smartphones or as standalone power banks, are well known to be a fire risk, especially if they’re faulty, badly made, or have incurred damage during their daily use. The most famous incident of recent times involved Samsung’s Galaxy Note 7, which was shipped in 2016 with faulty batteries that led to numerous reports of overheating and fires. The issue was so serious that the U.S. Department of Transportation banned the device from being taken onto American planes. Hoverboards also hit the headlines in 2015 after a spate of incidents which saw the personal transporter suddenly catch fire. They, too, were banned from passenger aircraft. Airlines around the world now have strict rules in place preventing passengers from placing spare, uninstalled lithium-ion batteries in their checked baggage. Power banks are considered as spare and so can only be taken on as carry-on luggage. While reports of such fires are thankfully rare when you consider how many lithium-ion batteries are in use today, Sunday’s incident shows just how fierce such a fire can be, with quick action needed to prevent the situation from spiraling out of control. You certainly wouldn’t want it to happen at 36,000 feet. Alexa already dominates a ton of living rooms and kitchens thanks to Amazon’s huge line of Echo smart speakers. But there’s still one major category of devices Alexa has yet to conquer: PCs. However, at CES 2018, Amazon announced that Alexa would be making its way onto computers too. That brings us to now, at MWC 2018, where Lenovo is showing off its line of new Yoga 730 2-in-1s, which are going to be one of the first systems sporting Alexa’s new PC integration. Depending on the model, you’ll also have the choice between silver and a darker gray color. For 2018, the Yoga 730's specs aren’t changing much. You’ll still get to choose from a range of 8th-gen Intel CPUs, up to 16GB of RAM and sizable 1TB SSDs, depending on the model. And aside from the new Alexa app, Lenovo says it has trimmed down the bodies off all three systems, resulting in generally sharper, and more edgy feeling designs. The displays are surprisingly sharp too. Size wise, the 15-inch 730's weight has dropped to just 4 pounds (13-percent less than before), while the Flex 14 is now 11-percent thinner at 17.6mm. Even the bezels around the screen have slimmed down a bit, though its hard to tell unless you’re looking at both old and new models at the same time. From top to bottom: the 13-inch Yoga 730, 14-inch Flex 14, and 15-inch Yoga 730. Other differences between various sizes of the Yoga 730 include USB-C charging on the smaller 13-inch 730, while the larger two still rely on proprietary Lenovo power bricks. 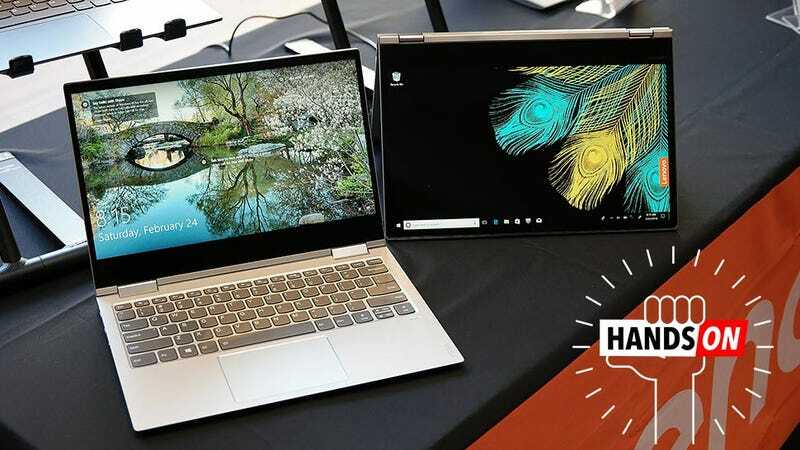 But what the Flex 14 and 15-inch 730 lack in charging flexibility, they make up for in connectivity, with both larger models sporting HDMI and extra USB Type-A ports. The Flex 14 and 15-inch 730 can also be equipped with optional GPUs, with the 14 offering up to a Nvidia MX 130, and the 15-inch Yoga 730 a GTX 1050. Strangely, the Flex 14 is the only one of the bunch with a built-in SD card slot. As for the new Alexa app, Lenovo is taking advantage of the far-field mics that debuted on last year’s model for use with Cortana to ensure Alexa can understand you clearly too—even from across the room. However, at least initially, Alexa on PC will have a few limitations that its speaker-based counterparts don’t suffer from. At launch, due to some legal issues around music streaming, Alexa won’t be able to play music from services like Spotify and others, and you may not be able to control some smart home gadgets using Alexa on PC either. That sounds like a big issue for some, but Lenovo says its working with Amazon to bring full Alexa functionality down the road. As before, the new Yoga 730's still come with a built-in fingerprint reader and full Windows Ink stylus support. While it might seem that Alexa would be at odds with Cortana, which is already built-in to every version of Windows 10, that may not necessarily be the case. Late last year, Microsoft and Amazon decided to working together to integrate Cortana with Alexa and vice versa. The idea of the two megacorps collaborating on AI and digital assistants still sounds a little strange, but if it leads to better voice control for PC users, that’s probably a good thing. All three versions of the Yoga 730 will be available in April, with the Flex 14 being the cheapest featuring a starting price of $600, while the 13 and 15-inch models starting slightly higher at $880 and $900, respectively. Alongside the Rebel T7 DSLR and 470EX-AI flash, Canon introduced a new mid-level mirrorless camera on February 25. Called the EOS M50, it inherits much of the tech from the similar-looking, but higher-end, EOS M5. But it also adds one feature that has been notably lacking from Canon’s mirrorless cameras until now: 4K video. At just $780 for the body only, we’re a bit surprised that the M50 is the first EOS M camera to go 4K, but we’re certainly not complaining. Canon has been slow to make the move to 4K across its still camera lineup, with only a couple of high-end DSLRs offering the feature (the EOS 1D X Mark II and EOS 5D Mark IV). Along with 4K, 1080p can now be captured up to 120 frames per second for slow-motion playback. That said, the M50 doesn’t offer much in the way of professional options for video shooters, and 4K is only offered at a single frame rate of 23.98 frames per second. Still, we expect the video quality will be a noticeable improvement over the 1080p in the EOS M5, which wasn’t exactly a highlight of that camera. A plus is a mic input. The extra video power is thanks in part to the new Digic 8 processor, which also helps push the continuous shooting speed up to 10 frames per second, or 7.4 with continuous autofocus. That’s some good speed in a camera at this price point, but the buffer is too small for serious sports photography, allowing for just 10 frames (or a single second of burst shooting) when shooting RAW files, increasing to 33 for JPEGs. Still, this should offer enough performance for the M50’s target demographic of beginner and intermediate photographers. The M50 also has an expanded high ISO setting of 51,200, which wasn’t available in the other M-series models. Thanks to the Digic 8, autofocusing has also been greatly enhanced. Canon said Dual Pixel AF system is an improvement over the DPAF system in the M5. The M50 has a 99-point system versus the 49 points in the M5, M6, and M100, covering a sensor area of 80 x 80 percent. However, with select lenses, focus area increases to 88 x 100 percent of the sensor, and up to 143 point. With the M50, Canon also introduces a new RAW format, CR3. Besides a full RAW file, CS3 offers the option of C-RAW. Unlike M-RAW and S-RAW in CR2, which lowered the resolution of a photo to achieve smaller file sizes, C-RAW maintains the full resolution, but 40-percent smaller in file size. Canon said there’s less data to work with for editing purposes, but the image quality would be difficult to differentiate for most people. The rest of the features are quite similar to those offered in the M5, including a 24-megapixel APS-C sensor that’s similar but not the same. 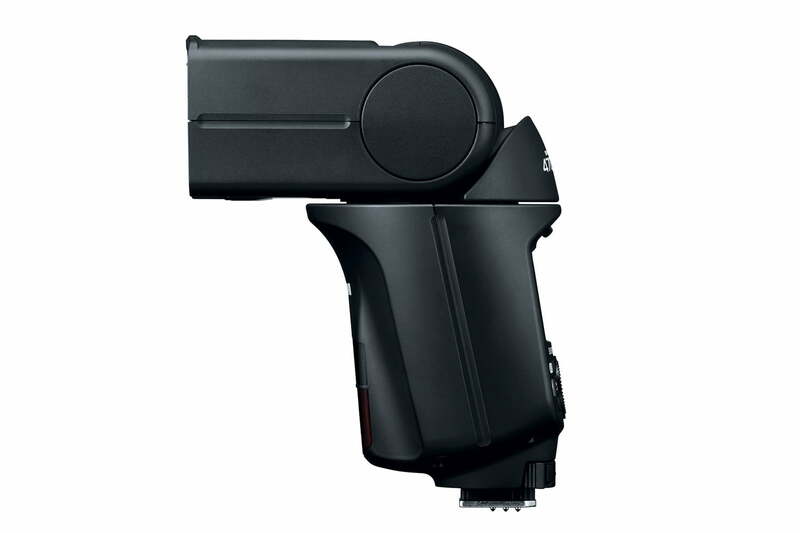 The M50 also uses a 2.36-million-dot electronic viewfinder (EVF). Like the EVF of the M5, it is situated DSLR-style, directly above the lens mount. The touch-sensitive LCD can be flipped out, with vari-angle tilting — a request from customers. Arriving in April, the M50 will be available in three kits in addition to the body-only option. The EF-M 15-45mm lens kit will sell for $900, while a two-lens kit that also includes the EF-M 55-200mm lens will go for $1,249. A Video Creator Kit will be available for $1,000, but Canon did not offer specifics of what it would include. What is a mirrorless camera and what makes it different from a DSLR? 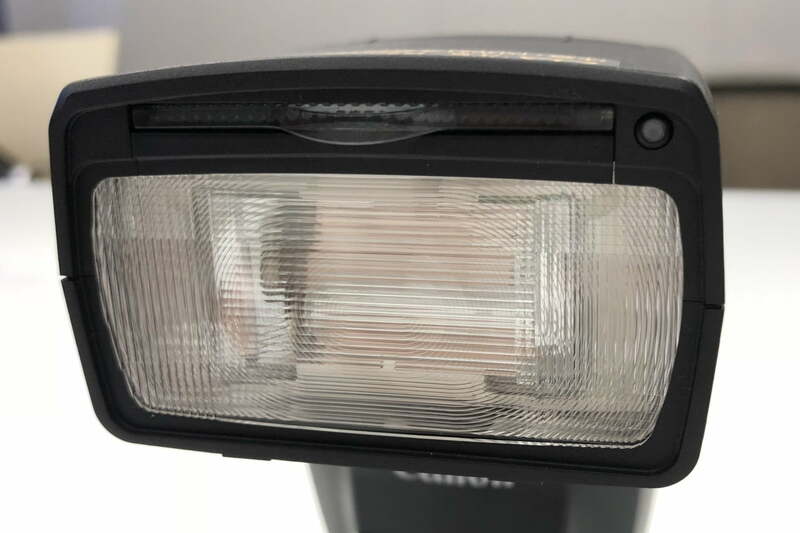 Calling it the the “natural next step” in the evolution of DSLR camera systems, Canon has introduced the 470EX-AI speedlite that promises better flash photographs thanks to, yes, artificial intelligence. Geared toward beginners and enthusiasts looking to learn more about flash photography, the 470EX-AI automates one aspect of on-camera flash shooting that experienced users have long been doing manually: bounce angle. A common mistake novice photographers make when first working with an external flash is to point the flash head directly at their subjects. This leads to what is often called the “deer in the headlights” look and can produce harsh, unnatural shadows. By pointing the flash upwards, the light bounces off of the ceiling and produces a much more natural, softer look with a more even exposure. 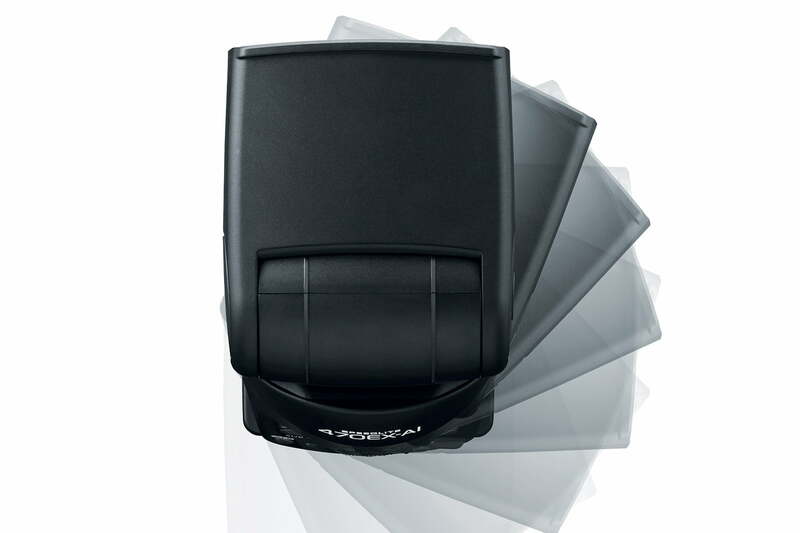 Canon’s new AI Bounce technology measures the distance between the flash and the subject, and the distance between the flash and the ceiling to determine the optimal bounce angle. The 470EX-AI automatically tilts the flash head to the correct position, making for what is perhaps the most foolproof flash system yet. The flash is even smart enough to remember the proper bounce angle when switching between portrait and landscape orientations, and will automatically return to that position. 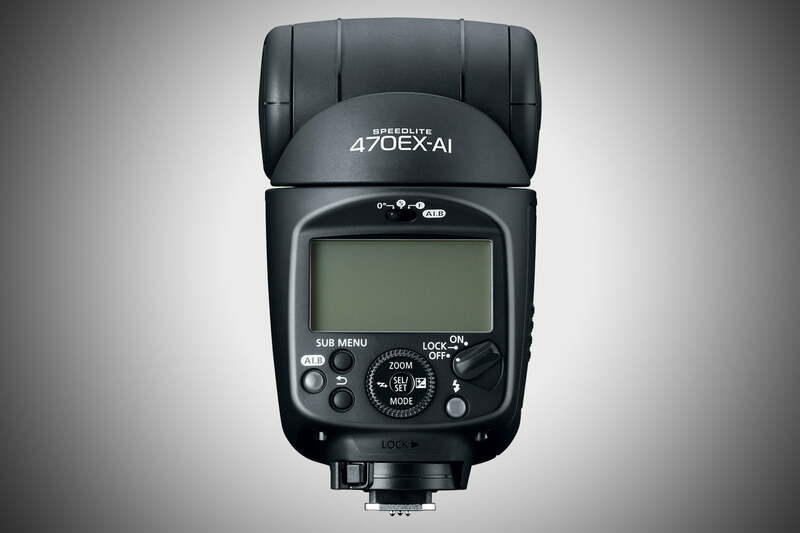 While not geared toward professionals, the 470EX-AI is still a capable flash beyond the AI Bounce tech. It features an optical receiver for remote, off-camera use and a focal length coverage range of 24mm to 105mm (and 14mm when using wide-angle diffuser). Canon advertises a maximum reach of 77 feet in normal mode, based on testing with a 50mm lens at f/1.4 and ISO of 100. Powered by four AA batteries, it acheives a minimum recycle time of 0.1 to 3.5 seconds (depending on power setting) when using NiMH batteries. 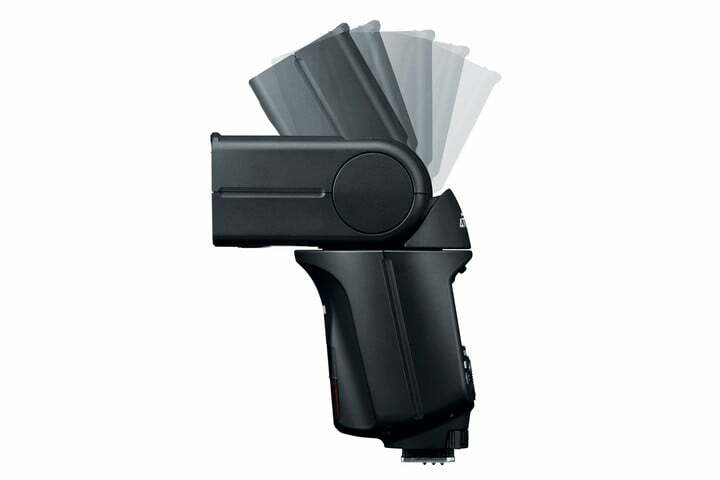 As with other Canon speedlites, Canon advises against the use of lithium-ion batteries due to heat concerns. We had a brief opportunity to try the flash using a EOS Rebel T7i. 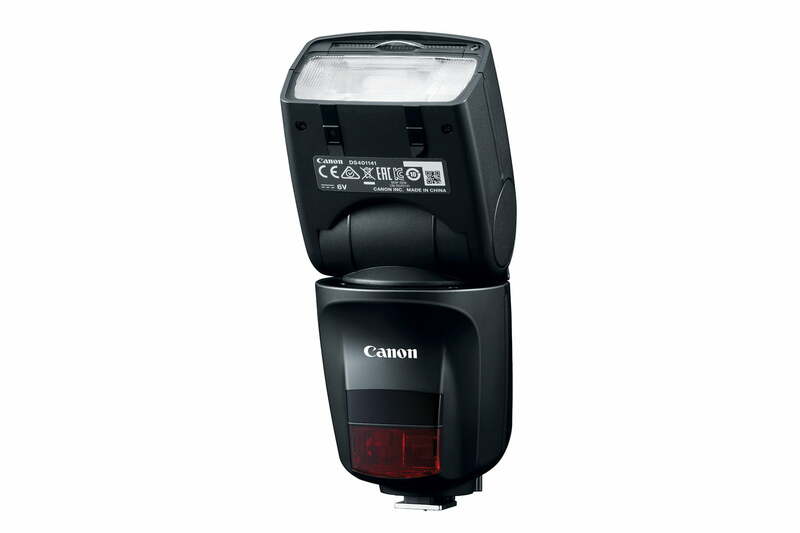 Canon said the flash’s fully automatic mode works with newer EOS DSLR. Older DSLRs, as well as the EOS M mirrorless cameras, will support the flash’s semi-automatic mode, which requires the user to manually adjust certain angles. To activate AI Bounce, you simply double tap (two half-presses) on the shutter button; then, the flash comes to life, automatically measuring the room. If you turn the camera on its side for portraits, the flash automatically repositions itself. Sometimes the flash requires recalibration, but all you need to do is double-tap again. It’s actually enjoyable to play with. A sensor at the top-right measures the distance from the flash to the subject, and to the ceiling. The flash was unveiled on February 25 alongside two other new Canon products geared toward beginner and intermediate photographers: the EOS Rebel T7 DSLR and EOS M50 mirrorless camera. The 470EX-AI is slated to be available in April for a price of $400. What is a DSLR camera and what sets it apart from mirrorless and point-and-shoots?